News Monitors Blog: Bits: Data storage; polymer supercapacitors; zero field switching. Scientists from RMIT University and Wuhan Institute of Technology demonstrated a next-generation optical disk with up to 10TB capacity and a six-century lifespan using gold nanoparticles. The technology could radically improve the energy efficiency of data centers according to the researchers, using 1000 times less power than a hard disk center by requiring far less cooling and doing away with the energy-intensive task of data migration every two years. The optical disk uses a novel nanoplasmonic hybrid glass matrix. Glass is a highly durable material that can last up to 1000 years and can be used to hold data, but has limited storage capacity because of its inflexibility. The team combined glass with an organic material, halving its lifespan but radically increasing capacity. To create the nanoplasmonic hybrid glass matrix, gold nanorods were incorporated into a hybrid glass composite, known as organic modified ceramic. The researchers chose gold because like glass, it is robust and highly durable. Gold nanoparticles allow information to be recorded in five dimensions – the three dimensions in space plus color and polarization. The researchers believe the new optical disk would be primarily used for “long data” – mining of massive datasets collected over decades and centuries. While the team says further work is needed to optimize the technology, they say the technique is suitable for mass production. Researchers at the University of Cambridge developed a new supercapacitor material by weaving two polymers together in a way that vastly increases charge storage capacity. Conducting polymers, such as poly(3,4-ethylenedioxythiophene) (PEDOT), are candidate supercapacitors that have advantages over traditional carbon-based supercapacitors as charge storage materials. They are pseudocapacitive, meaning they allow reversible electrochemical reactions, and they also are chemically stable and inexpensive. 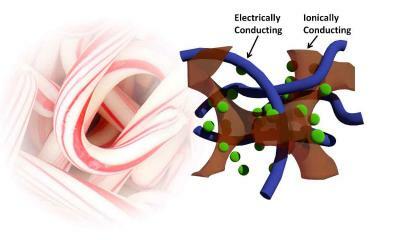 However, ions can only penetrate the polymers a couple of nanometers deep, leaving much of the material as dead weight. Scientists working to improve ion mobility had previously developed nanostructures that deposit thin layers of conducting polymers on top of support materials, which improves supercapacitor performance by making more of the polymer accessible to the ions. The drawback is that these nanostructures can be fragile, difficult to make reproducibly when scaled-up and poor in electrochemical stability, limiting their applicability. Still, there’s room for improvement, said Stoyan Smoukov, a researcher at Cambridge. “In future experiments, we will be substituting polyaniline for PEDOT to increase the capacitance. Polyaniline, because it can store more charge per unit of mass, could potentially store three times as much electricity as PEDOT for a given weight.” That means lighter batteries with the same energy storage can be charged faster. Researchers at NIST and Johns Hopkins University found an unexpected phenomenon called zero field switching (ZFS) which they say could lead to smaller, lower-power memory and computing devices. The team layered platinum (Pt), tungsten (W), and a cobalt-iron-boron magnet (CoFeB) sandwiched at the ends by gold (Au) electrodes on a silicon (Si) surface. The CoFeB layer is a nanometer-thick magnet that stores a bit of data. A “1” corresponds to the CoFeB magnetization pointing up, and a “0” represents the magnetization pointing down. The “0” or “1” can be read both electrically and optically, as the magnetization changes the reflectivity of light shining on the material through another phenomenon known as the magneto-optical Kerr effect (MOKE). 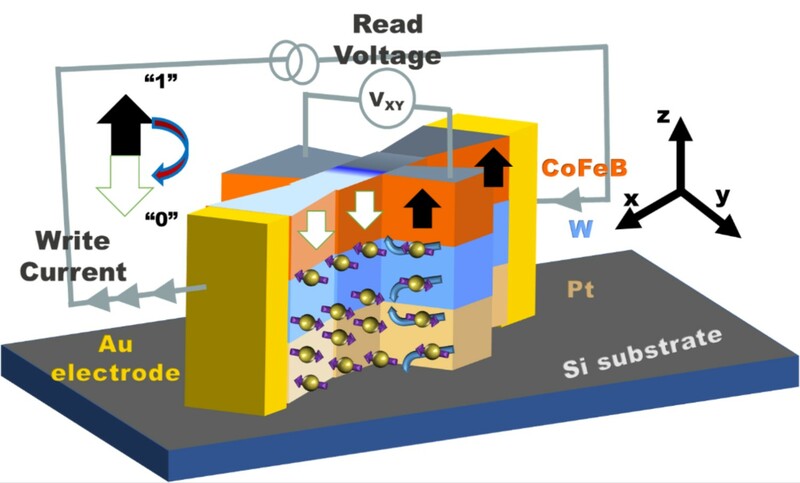 The team discovered that they could flip the CoFeB magnetization in a stable fashion between the 0 and 1 states by sending only electric current through the Pt and W metal layers adjacent to the CoFeB nanomagnet. They did not need a magnetic field, as previous devices of this type required. The researchers created “spin” current, electric current in which the spins of the electrons are pointing in the same direction. As an electron moves through the material, the interaction between its spin and its motion (called a spin-orbit torque, SOT) creates a spin current where electrons with one spin state move perpendicular to the current in one direction and electrons with the opposite spin state move in the opposite direction. The resulting spins that have moved adjacent to the CoFeB magnetic layer exert a torque on that layer, causing its magnetization to be flipped. Without the spin current the CoFeB magnetization is stable against any fluctuations in current and temperature. This unexpected ZFS effect poses new questions to theorists about the underlying mechanism of the observed SOT-induced switching phenomenon. Details of the spin-orbit torque are illustrated in the diagram above. The purple arrows show the spins of the electrons in each layer. The blue curved arrow shows the direction in which spins of that type are being diverted. (For example, in the W layer, electrons with spin to the left in the x-y plane are diverted to move upward toward the CoFeB and the electron spins to the right are diverted to move down toward the Pt.) Note the electron spins in the Pt with spin to the right (in the x-y plane), however, are diverted to move upward toward the W and the electron spins with spin to the left are diverted to move downward toward the Si. This is opposite to the direction the electron spins in the W are moving, and this is due to differences in the SOT experienced by electrons moving through Pt and those moving through W. In fact, it is this difference in the way the electrons move through each of these two conductors that may be important to enabling the unusual ZFS effect.